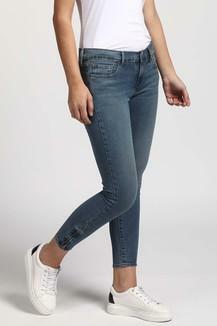 Let your style do the talking by wearing this pair of jeans from the famous clothing brand, Levis Ladies. It features a vintage wash effect that renders it fashionable. Besides, it has a fixed waistband with belt loops that will allow you to team it with a fancy belt. Featuring a vintage wash effect, this pair of jeans will be an ideal pick for you to wear for any casual occasion. It can be teamed with a crop top and a pair of ballerinas for a smart look.